Blues Guitarist Johnny Winter Dies At 70 : The Two-Way Texas blues legend Johnny Winter has died, ending a long and expansive career that included working alongside bluesman Muddy Waters and playing at the Woodstock festival. Winter emerged on the national scene in 1968 after being featured in a Rolling Stone article. That same year, he released his first album, The Progressive Blues Experiment. One year later, he released his self-titled album, and then a follow-up called Second Winter. 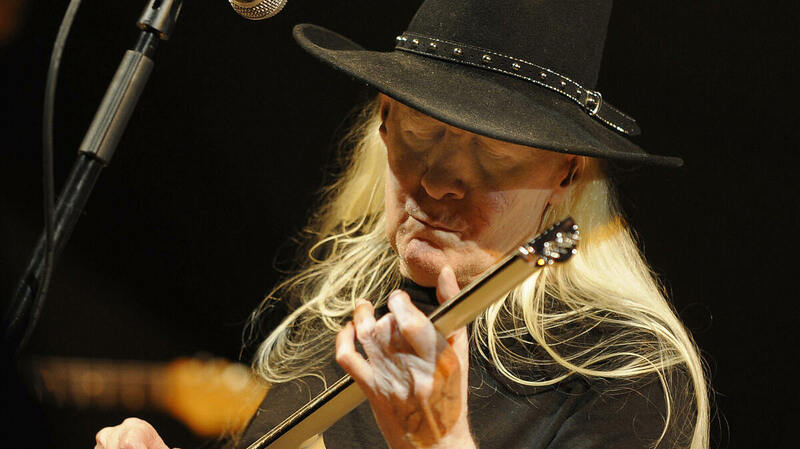 In the rankings of the all-time greatest guitarists, Winter was named No. 67 by a Guitar World reader poll, and No. 63 by Rolling Stone. His website calls Winter "the clear link between British blues-rock and American Southern rock (a la the Allman Brothers and Lynyrd Skynyrd)." Winter has said he benefited from being exposed to many styles of music as a kid, particularly the blues music he would hear in clubs in his native Beaumont, Texas. And it seems that even in the racially charged era of the 1950s and 60s, the albino kid was seen as just another person who loved the blues. "Nothing ever happened to me," Winter said on his website. "I went to black clubs all the time, and nobody ever bothered me. I always felt welcome." "Not many white people in Beaumont cared about the blues," he told NPR's Scott Simon in 2011. "I just liked the emotion and the feeling in the music. It was the most emotional music I'd ever heard." A longtime fan of Muddy Waters, Winter produced and played guitar on Waters' Grammy-winning album Hard Again in 1977, along with three other Grammy-nominated records. The two met when Winter was around 17 — after the teenager bugged the bluesman to let him play with him on stage. "He gave me his guitar and let me play," Winter said. "I got a standing ovation, and he took his guitar back." Of Winter, Waters once said, "That guy up there onstage — I got to see him up close. He plays eight notes to my one!"